You’re going to hear us talk a lot about semantic interoperability this year. So we might as well present a working definition. portable and well understood by any subsequent system requesting and reviewing it. Why will we be talking about it a lot? Because without semantic interoperability, the Experience API (xAPI) has a limited future. For us, semantic interoperability in xAPI will be achieved when there is a generally accepted information model. We expect profiles to help with this a great deal. There’s a strong possibility that collaborative work between ADL and IMS could help a great deal. Consider SCORM, the usage of which remains widespread in LMSs everywhere. The CMI data model leveraged by SCORM is closely linked to its information model. There is a finite set of data that can be recorded about the types of learning experiences common to online training, and summarizing information from that data is a relatively straightforward exercise. So straightforward, in fact, that practitioners have long cared primarily about a big four—score, completion, satisfaction (i.e., pass/fail), and duration. SCORM makes requesting and understanding the big four easy. xAPI, on the other hand, is fundamentally a communication protocol applied as a specification for elearning. 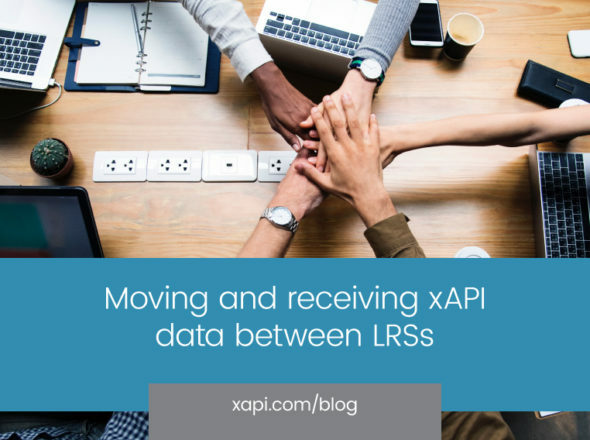 In xAPI, apart from a few familiar holdovers from SCORM (the big four, native support for interactions), there is no limit to what can be captured about a given learning experience. One could literally choose any verb available in any language. Or one could create a new activity definition to describe any type of experience. Can you imagine how difficult it would be to report on data with so few constraints? We can. Because we’ve been trying. Even when there is consensus that a concept has sufficient value to merit a profile, there can be difficulty. Take video, for instance. Not only is there a profile in our Registry, there’s also a Community of Practice still working on a version. If there are multiple working versions of what data to capture, then how is a reporting system attempting to derive meaning about “video” supposed to do so? We think the answer right now is: leadership. The concept of Registry has utility to semantic interoperability in xAPI, and we have a feature roadmap for it. Still, we recognize the difficulty in a single industry participant to establish credibility and trust. What would alternatives look like? We think ADL could assert an information model. As a subtle alternative, ADL could host a collaborative process with some authority. This might look like the establishment of a baseline with a community process similar to how the specification itself operates now—managed workflow in GitHub supported by regular calls. Expect to hear more from us on this topic because we think it’s critical to the future success of xAPI.